One of my step-mother-in-law's sisters keeps bees. 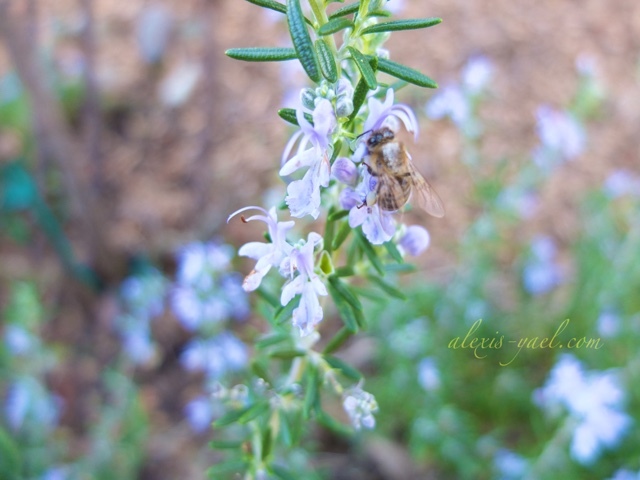 I don't think we'll get a chance to go visit her this time out, but watching the bees in my mother-in-law's rosemary today reminded me of that colony, which we visited last summer. What a blessing bee keeping is. Taking care of the bees and receiving their honey (and wax). Helping the pollinating of the world. I believe this is sacred work, local beekeeping. I'm happy to support bees and their keepers. I'm happy to support anyone or anything who is supporting flowers. Spring has really just begun here in Northern California. It's a wonderful time to be visiting. I love it all so.